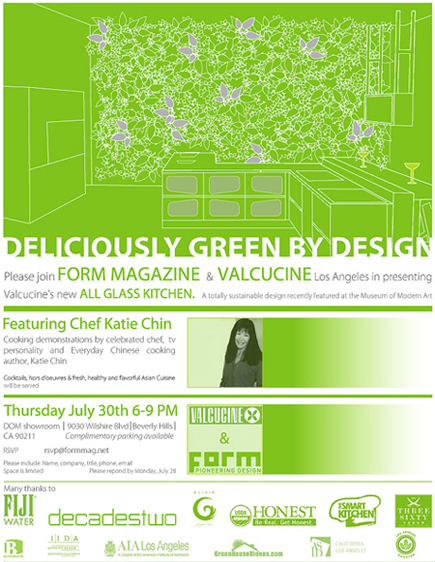 Valcucine Los Angeles and FORM magazine covered by GreenHouseVideos.com BALCONY MEDIA, INC. will host Chef Katie Chin, slow food proponent, and Valcucine’s 100% Recyclable Kitchen Design, Invitrum on Thursday July 30th 6-9 PM. FORM magazine and Balcony Media premiers Valcucine’s totally recyclable glass kitchen cabinet system, a new recipe for kitchens, one that is truly eco-conscious. The counter base unit is made from 100% recycled glass. The slim frame of Invitrum is made of recycled aluminum, which takes “just 5% of the energy needed to obtain primary aluminium.” Come discover Invitrum’s other superior design innovations and have fun all at once. To partecipate, please RSVP to rsvp@formmag.net. Include name, title, company, phone and email. We highlight here the participation of activist Vandana Shiva at the Terra Madre 2008 International Forum on Future of Food and Agriculture on the 23-27 October 2008 in Turin, Italy. In 2002 Vendana Shiva was awarded with the Premio Mazzotti for Literature – section Ecology; in that occasion she also met Mr. Gabriele Centazzo, chief administrator of Valcucine, and Mr. Lino Centazzo, chief director of WWF organisation in Pordenone. Turin, Italy — I’ve just come out of the most hopeful and interesting discussions of climate change I’ve ever witnessed. Anchored by Indian food-sovereignty activist Vandana Shiva, the panel discussion at Terra Madre unveiled a new “Manifesto on Climate Change and the Future of Food Security,” drawn up by the International Commission on the Future of Food and Agriculture. To me, Shiva and her multinational crew of colleagues (other commission members include Wendell Berry, Jose Bové of Via Campesina, Frances Moore Lappé, and Alice Waters) have articulated a powerful new vision for confronting climate change — one more potent even than Al Gore’s famed slides and push for trade-based solutions.